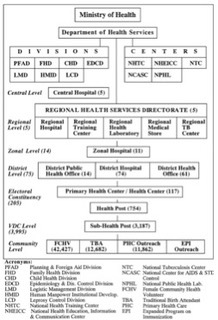 The health care facilities and the organizational structure of the Ministry of Health Department of Health Services in Nepal are shown in fig 3. The administrative reorganization of the whole country in 2017 also has impact on the structure of the health care system. Provinces and Gaun Palika’s replace zones, regions, districts and VDC’s of the former organization. The new organizational structure of the Department of Health Services in Nepal is under construction. The health care system in the communities of Nepal consists of 2 key parts: community based facilities and peripheral health facilities.